The brief was to design a building which would mirror and promote The Ear Institute’s philosophy of exceptional service and efficiency, whilst providing a comfortable and professional environment for staff and patient alike. Acoustical guidelines were set for the general building and specifically for the specialised areas. Maximum utilization of the site within the land use rights was required to ensure adequate room for future expansion. All existing buildings on the site were to be retained. The level stand occupies a prominent corner on a busy street in a built up residential area. A multi-storey home for the aged and a church flank the property on the remaining sides. Both adjacent buildings make extensive use of off-shutter concrete and face brick. 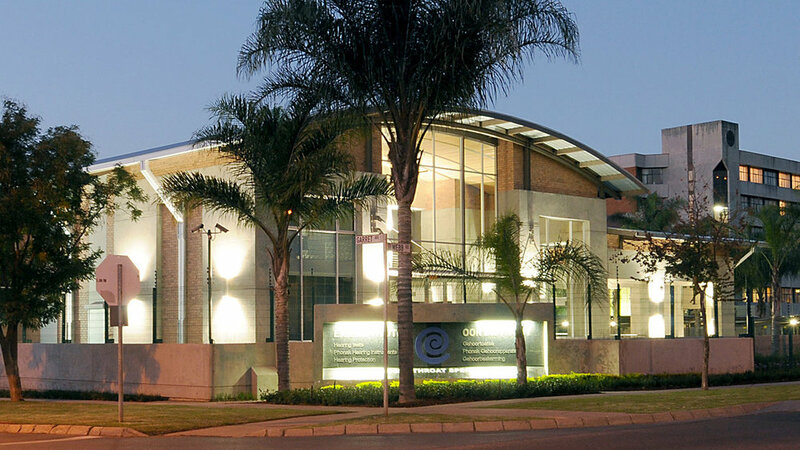 Similar materials were used in the Ear Institute to enhance contextual character. A landscaped, open-air patio sets the building back from the street in defence to the neighbouring dwellings. In order to comply with parking requirements and height restrictions, a secure parking basement was incorporated for staff. The works were placed on the western building line of the stand, running in a north-south direction. 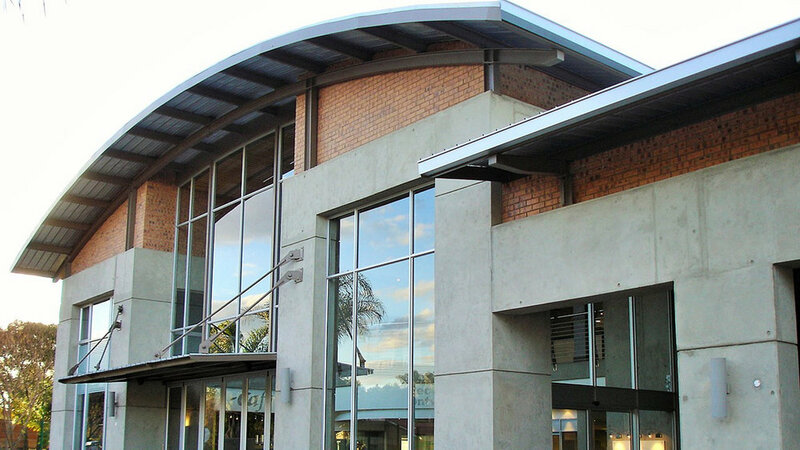 The simple rectangular shape was reinforced by the introduction of of-shutter concrete frames and the roof line softened by using a gently curved roof with generous overhangs. Terracotta face brick panels complete the western and eastern walls, incorporating minimal fenestration. These windows were fitted with acoustic glazing and anodised aluminium shutters to control noise and direct sunlight. Large, recessed, glazed facades set off the northern and southern aspects, allowing natural light to filter through the central spaces. A porte-cochere provides covered pedestrian access via ramp and stairs. Internal finishes and materials were chosen for durability and acoustic properties, with special attention to insulated doors and ceilings. 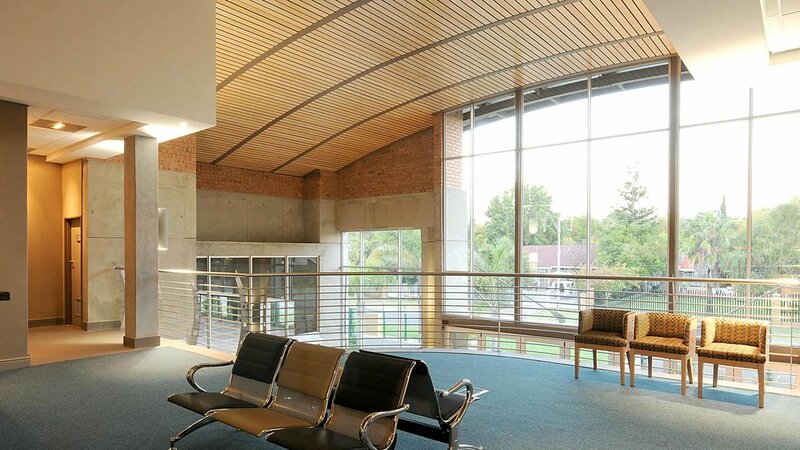 The strip maple ceilings, although integral to the acoustic design, contribute warmth and showcase the curved ceiling. The successful completion of this specialised project can be attributed to the close design and working relationship enjoyed by the architectural team with the client.